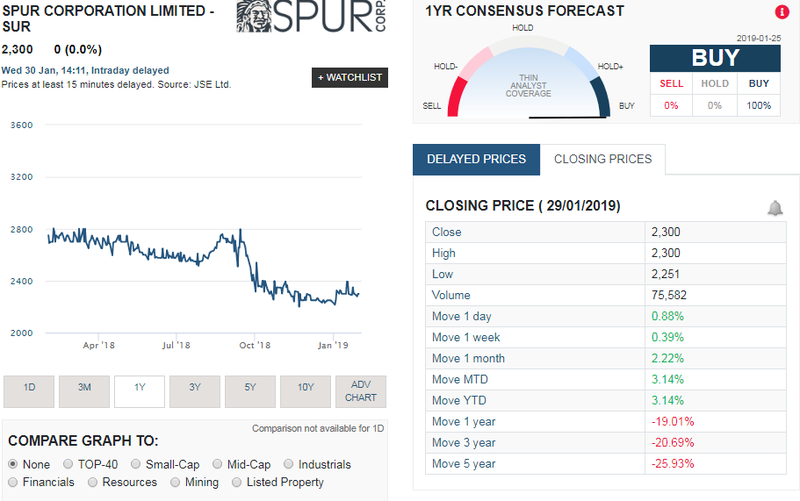 We take a look at the trading update brought out by Spur Corporation (SUR), and in the update it looks like the star of Spur Corporation in recent years, Rocomamas is starting to feel the consumer pinch. Franchised restaurant sales for the group increased by 6.5% to R3.9 billion in the six months to December 2018 (“the period”). In South Africa, franchised restaurant sales increased by 5.7%. Sales from international restaurants increased by 12.7% in Rand terms and by 12.1% on a constant exchange rate basis. Sales information included in this announcement excludes the Captain DoRegos chain which was sold with effect from 1 March 2018. Locally, 25 outlets were opened and 6 closed during the period, while 14 restaurants were opened internationally. In addition, the group acquired the Nikos Coalgrill Greek chain, which comprised six restaurants at the effective date of 1 August 2018, and opened two further outlets subsequently. At 31 December 2018, the group’s restaurant base totalled 616 (June 2018: 575), including 76 (June 2018: 62) operating outside of South Africa. Chief executive, Pierre van Tonder, said: “Local franchised restaurant sales increased by 11.3% in the first quarter to September 2018, supported by the continued recovery in the Spur Steak Ranches brand and a strong performance in The Hussar Grill, while sales growth in the second quarter slowed to 1.2%. While the second quarter performance was disappointing, it is generally consistent with sales trends in the local retail sector. The South African consumer is taking significant strain due to the sombre state of the economy, although the performance of The Hussar Grill indicates that higher-income consumers continue to be more resilient to the weakening economy.” Van Tonder noted that sales from existing restaurants in the RocoMamas chain reflect a period of consolidation following the unprecedented increase in restaurant numbers since acquisition in March 2015. He added that restaurant turnover for the Panarottis chain was impacted by aggressive discounting by competitors in the takeaway pizza market. “While restaurant trading conditions have deteriorated in Australia and New Zealand, Africa and Mauritius traded well. In particular, 7 new Panarottis restaurants were opened in Zambia, increasing the number of restaurants in that country to 12. The first The Hussar Grill was opened in Saudi Arabia during the period, while the group’s first restaurant, a RocoMamas, was opened in India. The screenshot (taken from Sharenet) below shows the performance of SUR over the last 12 months, and it has been a slow gradual decline from around R28 a year ago to the current price of R23.00 a share. And as the screenshot shows the share prices has not provided positive growth for shareholders in the last year, 3 years or 5 years. Just showing how tough the food and beverages market in South Africa has been in recent years. More about that sector can be found here.